I suffer from the flakies, too. My skin and hair have always been dry, but it became outrageous after the birth of my son. Hormones all out of whack and such. I stumbled onto Dempeaux’s blog after you suggested reading it and have begun to incorporate parts of her skin care routine into mine. I look forward to the future installments! ooh. I hate dry skin and i hate the cracked skin feeling on my cheeks in the winter. I recently went to get my skin tested at shiseido and they recommended cleansing only once a day instead of twice so I only moisturise in the mornings. 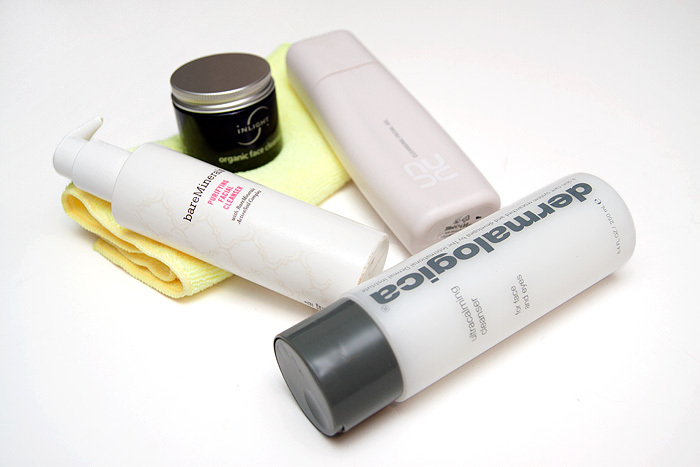 Also i’e also learnt to stay away from cleansers for acne and teenage skin. My skin is very dry, due to my age. I cleanse my face with a Clairisonic and the creamy Clarisonic cleaser. I rinse with lukewarm water and pat dry with a towel. This is after removing my eye and face makeup. I use La Roche-Posay Toleriane to cleanse, Cure Natural Aqua Gel to exfoliate (found it works better than the Dermalogica Daily Microfoliant) and MU London Organic Moisturiser (fragrance Free). I have dry sensitive skin and I love these products so much. I’m still looking for a good face wash…I use Invisible Zinc IZ Cleanser at the moment, but I’m not loving it as it stings my eyes. I wash my face with water only in the mornings, no cleansers or soaps. I save the cleansers for nighttime. I like MAC cleansing oil – its got no mineral oil in it either. and i’m not a massive MAC make up fan. I’ve had good results with avene moisturisers also. I’m sorry but as a scientist your ‘PH’ which is actually ‘pH’ is making my skin crawl. As a humanitarian (who is in no way a scientist but is just trying to share a few tips), your unkind manner made me feel sad. So I guess we’re even. Real quick: inspired by your grace and dignity handling that. It wasn’t my intention to make you sad. I am just OCD about getting things right so will research anything I am unsure about (hence the career path). And just to add that our skin is actually slightly acidic so the alkaline limescale-laden water is probably even worse than you thought. Hello Charlotte, thank you for clarifying! Had I researched the correct capitalisation, you can guarantee I would have still forgotten it at the crucial moment! Always very happy to be educated about things by others in the community who know more than me (it happens lots! ), one of the pleasures of having access to so many different opinions and chatty women. I’m not a precious type but won’t pretend I have the thickest skin either. I think it was the ‘skin-crawling’ thing that did it. A sensation if reserve for something far more heinous. Thank you for the extra info on the pH of skin, it’s naturally acidic to help fight bacteria isn’t it? Like a built-in protection? I usually use coconut oil to cleanse my skin, followed by Weledas almond cleansing cream, to remove oil residue. I’m really happy with it – I used to use the oil for eye makeup, which is SUPER effective, but tried it for the entire face on a whim one day. I really like it, I think my skin looks generally healthier, and somehow more ‘plush’ as well. My skin has always been combo for as long as I can remember ever having tackled it. This past winter however, it went dry. Like really really dry. Massive flakes were peeling off all over the oiliest parts of my face and this confused me. I panicked and slathered on tonnes of moisturising products that did nothing at all. My salvation was the pink toner by Garnier (I can’t remember the name but you know they do a green one and a pink one, it’s the latter). It says that it is for sensitive/dry skin and it really sorted my skin out. I’ve got soething else that also works but I’m not sure if it fits into cleansing. It’s the Aloe Vera serum from The Body Shop. It sorted my dry skin out a treat.